Each recipe is created using only high quality, carefully selected 100% natural ingredients. 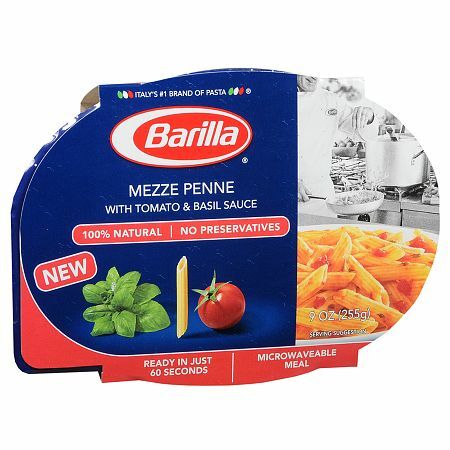 The pasta and sauce are cooked to perfection to ensure excellent quality without using preservatives. Our revolutionary packaging separates the pasta from the pourable sauce cup to maintain the taste, texture, and freshness of each classic dish. Ready in just 60 seconds. For softer pasta after cooking, add 1 teaspoon of water, mix carefully, cover and microwave for an additional 30 seconds.. © 2012 Barilla America, Inc. CONTAINS WHEAT INGREDIENTS. THE PASTA PRODUCT IS MANUFACTURED ON EQUIPMENT THAT PROCESSES PRODUCTS CONTAINING EGGS..